Two unnamed engineers working on the project shared the details of the updated application with Nick Bilton of The New York Times. He reported on Wednesday that the rebuilt application will focus on speed and performance. "One of the Facebook engineers said the new application has been built primarily using Objective-C, the programming language used to build applications for iOS," Bilton wrote. "Many of the components of the current version of the Facebook app are built using HTML5, a Web-based programming language." Bilton tested the unreleased iPhone application and said it delivers "blazing fast" performance. He said the application is being tested by developers and should be released this summer, indicating that it is expected to launch "next month." Though it will be rewritten, the application "looks exactly like the old one," he said. All of the changes have been made behind the scenes to improve performance. The Facebook application has been available on iPhone for years, but the social networking site released its official iPad application last fall. The iOS software is universal, meaning it has built-in support for both the iPhone and the iPad. 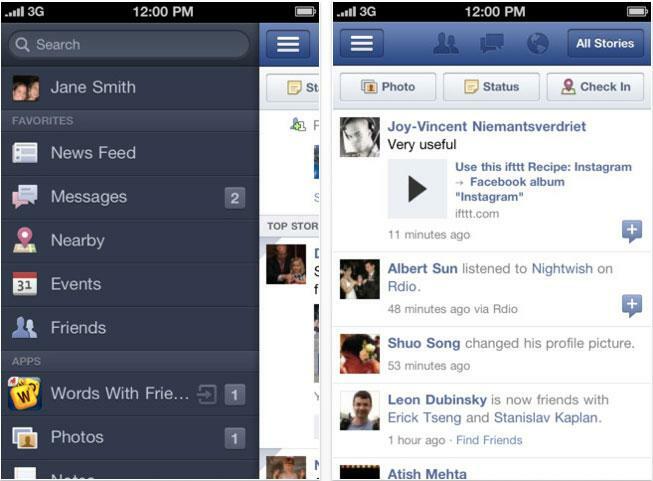 Facebook will also play a major role in the release of iOS 6 this fall>. With iOS 6, Apple will add system-wide Facebook integration, allowing users to log in to their account in the iOS Settings application in order to quickly post to their Facebook account and share music, applications and photos with their friends.